Keith claims it all started the night we found out that I was pregnant. We had been hoping to have a baby for quite a while, so when the test was positive, I drove out to the lab where Keith works to share the news with him (incidentally, the lab was locked and there is only spotty cell phone reception, so I had to linger creepily by the door until an unsuspecting undergraduate exited). When I walked into his office, Keith panicked, asking, “What’s wrong?! ?” But once we cleared up the misunderstanding, and he realized that something was instead very right, he decided we should go out to celebrate. We were trying not to go out to eat too often (remember…do-it-yourself spirit of frugality? ), but that night was a bit surreal, and we felt the need to commemorate it somehow. 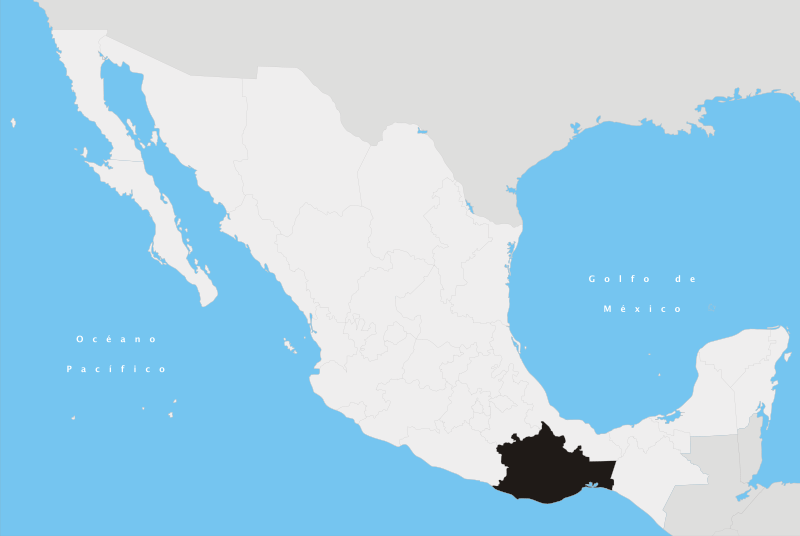 Oaxaca, one of Mexico’s 31 states. Did you know Mexico had 31 states? I’m embarrassed to admit that I had no idea until I researched it for this post. Can you believe that I’ve lived almost 30 years without knowing the number of states in a country that borders ours? We went to El Monte Grill. Though this white girl is pretty partial to mushy refried beans and basic taco salad (see my previous post about my mom’s idea of family dinner night), Keith likes “authentic Mexican food.” So El Monte is no Tex-Mex place. It specializes in Oaxacan food (Keith tells me that “Oaxaca” is pronounced “wa-haw-ka,” but I have to ask him to say it again every time–“Hey, how do you say that word that’s the name of that state in Mexico?”–to his credit, Keith always knows what I’m talking about). These are the moments in the “happily ever after” phase of marriage that the movies don’t show you. “I didn’t know that beans could taste like that!” Keith said later of his meal at El Monte. “I mean, I was distracted from the main dish by the thing that was supposed to be the side dish!” And so, according to him, the quest for flavorful, from-scratch, authentic, stand-alone beans began. Though Keith normally loves carne asade tacos, the side of beans was more engrossing that night. Our track record with beans has not been good, so I have to admire his gumption for trying again. Six years before that night at El Monte, in our humble Bratislava apartment, we first attempted to cook beans, and it is a painful memory. Though we both loved quesadillas and craved Mexican food, we could not find beans (see previous post about packaged foods in Slovakia looking different than packaged foods in the States). But we vaguely remembered that, if one couldn’t find canned beans, there were these hard things one could soak and then cook, and then, voila! It was just as if one had opened a can of beans. We got a recipe from Keith’s stepmom. It involved soaking uncooked beans overnight in a pot of water, adding (actual) garlic (not garlic powder?! ), and cooking them in boiling water with other things like onion and salt and pepper. Our first attempt at beans went beyond mischance or misadventure. In fact, it was an unmitigated disaster approaching calamity status. Full of do-it-yourself spirit, we put the beans in a pot on the stove to soak. Then, overwhelmed by the day-to-day responsibilities of teaching, we forgot that we were soaking beans. A few days later, we started sniffing the air. “Does it smell funny in here to you?” I asked Keith upon entering the apartment one day. “Hmm. Yeah. Kind of like something died?” he responded. “Like that,” I said. “Maybe it’s time to do some dishes.” I’m not proud of this fact, but it’s true: dirty dishes occasionally pile up haphazardly on our counters. For extended periods of time. Until they start to look crusty or fuzzy or until we have company coming. Gross, I know. 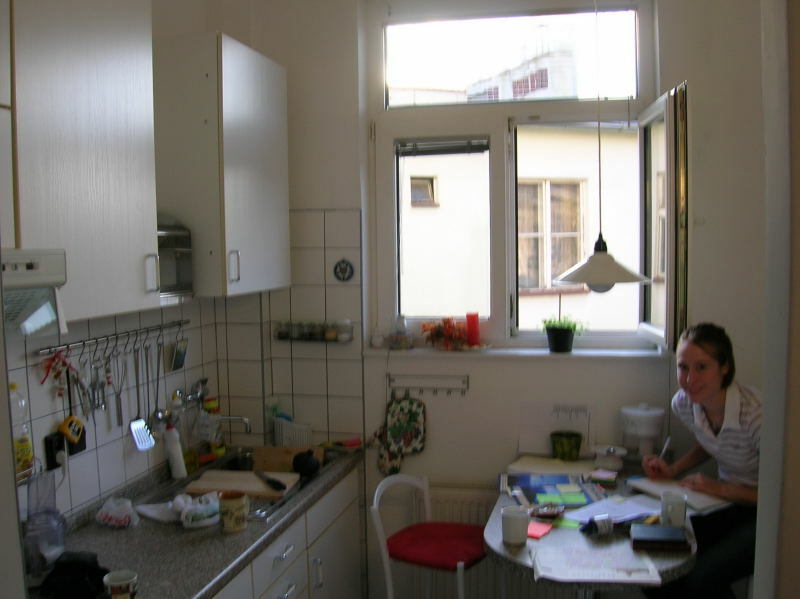 Our kitchen in the Bratislava apartment…note the dishes scattered about. This picture was not posed for blogging purposes. So Keith manfully started in on the dishes. I elected to clean the bathroom. When possible, we try to clean at the same time. It’s much easier to clean when you’re suffering through it with someone else. Misery loves company and all that. The unmitigated-disaster-approaching-calamity happened when Keith unthinkingly grabbed a dirty pot off the stove to carry it to the sink…except that it wasn’t just a dirty pot. That was when we remembered the beans because they spilled, along with their fermenting bean juice, all over the stove, the wall behind the stove, and the floor under the stove. And that was also when we pinpointed the source of the foul smell in our apartment. I pretended to be very engrossed in bathroom cleaning, despite Keith’s curses and pointed mutters of, “Disgusting! Foul! Wow, this is a lot of cleaning!” I don’t think I emerged from the bathroom until he directly requested my help in lifting the stove so that he could clean behind it. After performing my part while breathing only through my mouth, I beat a hasty retreat back to the bathroom to give the toilet yet another scrub as he finished removing all traces of bean juice and scouring the offensive pot. I refused to come out until he assured me there was no way I could be called into service to clean any bean-juice-drenched objects. Yeah, I probably still owe him for that one. We waited several months before our second attempt. We tried making beans again a few times, but we never really got it down to a science or an art, either one. Haunted by our foul failure, when we returned to the States we resumed our habit of buying beans in cans. After several years of buying the store-brand cans of beans (they’re cheaper, you know, than the name brand ones), we finally decided that we really couldn’t stomach the canned bean-sauce taste any longer. I guess people who want the convenience of canned beans without the canned-bean taste probably rinse and drain their beans. We, however, didn’t think of that, and so our bean consumption dwindled. We kept thinking we needed to pull out that old recipe and try again, but somehow we didn’t get around to it. Beans, beans, the musical fruit…let’s eat beans at every meal! That brings us to the fateful (in oh, so many ways) night of Keith’s revelation and the beginning of an intense phase of bean research. Keith took copious notes and did some scientific experiments (when not cooking beans, Keith studies electrical engineering, so he has a very exacting approach to kitchen work, changing one variable at a time and eating on the results for several days to really take in the full impact of his work). His version of Mexican beans is good. Really good. Like I said, I am a fan of the refried bean mush found at most Tex-Mex places. However, I have set aside my predilections and trained my palate to appreciate the fruits of his labors. His beans have good flavor. When he doesn’t put too much chipotle in them (white girl, remember? ), I like to eat them in burritos or tacos or on their own as a side–or a main–dish. They’re also really healthy because they have other vegetables in them, too, AND they use up some of that garden produce that otherwise tends to slowly wilt its way from our refrigerator to our compost pile! I am disseminating the results of his experimentation here free of charge (with his full permission), though Keith would add the disclaimer that, like any quest, this one is not (and probably never will be) finished. He welcomes your input and recipe adjustments. Feel free to add comments! 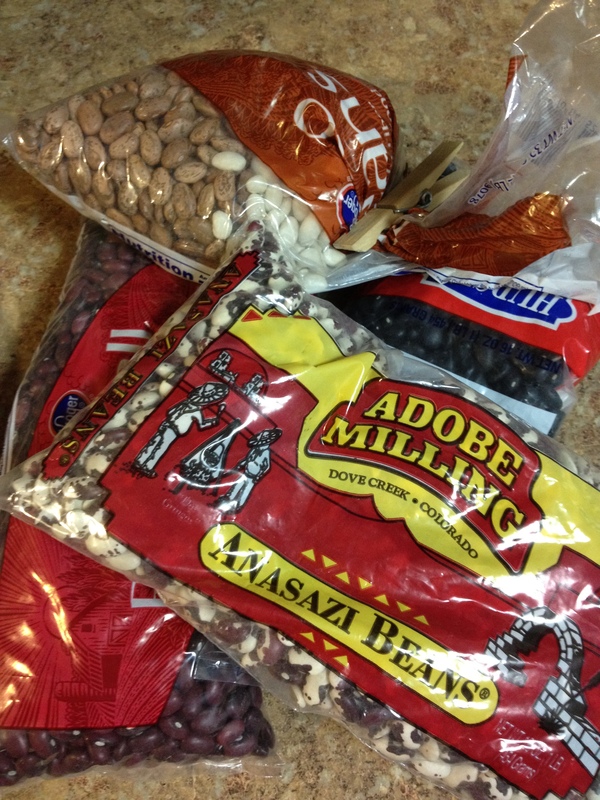 Step 1: Soak 2 and 1/2 cups of beans (any kind, really–pinto, black, red, or a mix) overnight. This makes A LOT of beans, so prepare to freeze some or feed a family reunion. Step 2: Next day, in the food processor, pulverize 3 carrots, 3 celery stalks, 3 cloves of garlic, a bell pepper (any kind), and 1 onion –NOTE: we usually double these vegetables and use half of the resulting mixture to make marinara sauce a la Giada de Laaurentiis, a delicious and very easy marinara sauce that enables you to say impressively, “Why yes, I did make this from scratch.” You can also use this veggie blend as part of salsa or chicken stock. It’s very efficient! Step 3: Sauté pulverized vegetables in a BIG sauce pan with bit of olive oil. After the onions become translucent, add spices: 1 Tbsp. paprika, 1 Tbsp. cumin, 1 tsp of chipotle powder (though I like pretty much none…and Keith likes it with 1 Tbsp…it just depends on how hot you want your beans). Sauté spices with vegetables 5-10 m. until very fragrant. Step 4: Add all beans to the sauté and just enough of the bean water to cover the beans. Bring to a hard boil and then turn down to a simmer. Simmer several hours, stirring occasionally til beans are soft. Step 5: At the end, add all other flavors: 1/2 c. brown sugar, 1 Tbsp. salt (to taste), diced jalapeño (if desired), 2 Tbsp. vinegar, and the juice of 1 lime or 1/4 c. orange juice. If you’re interested in other bean recipes, I’m really digging this website called the Kitchn. The title of their section on beans is “Beautiful Beans.” What’s not to love about a website that glorifies the musical fruit?